Or the most talked about chocolate chip cookies on my cooking board and in many food blogs, anyway. There have been many, many, many discussions about which recipe is the best. For the most part, I’ve stayed away from the discussions because I’ve always been so satisfied with the old standby but after a near disaster a couple of weeks ago where my cookies spread out into one huge cookie (the expiration date on my baking soda was fine! ), I decided that it was time for a change. As a regular reader of Annie’s Eats, I saw this pop up on my Google reader a few months back and I filed it away in the back of my mind until I was read for this change. And since this recipe has been one that has been highly touted as the favorite on my cooking board, I finally decided to give it a try. It didn’t take much for me to convince Kyle to at least let me try them (he thinks the Toll House recipe is only good cookie recipe) because the recipe has 2 full teaspoons of vanilla which he is a huge fan of in his cookies. Adjust oven racks to upper and lower-middle positions.Preheat oven 325°.Line two cookie sheets with parchment paper. Whisk dry ingredients together in a medium bowl; set aside.With electric mixer, or by hand, mix butter and sugars until thoroughly combined.Beat in egg, yolk, and vanilla until combined.Add dry ingredients and beat at low-speed just until combined.Stir in chocolate chips. Roll a scant half-cup of dough into a ball.Holding dough ball in fingertips of both hands, pull apart into two equal halves.Rotate halves 90 degrees and, with jagged surfaces facing up, place formed dough onto cookie sheet, leaving ample room between each ball.Bake, reversing position of cookie sheets halfway through baking, until cookies are light golden brown and outer edges start to harden yet centers are still soft and puffy (approximately 11-14 minutes).Do not overbake. Adjust oven racks to upper and lower-middle positions.Preheat oven 325°. Line two cookie sheets with parchment paper. Yummmm…. and I’m planning to try this CI/ATK recipe tomorrow! The chocolate chips look like they weren’t even cooked! Perfectly formed, still shiny and gorgeous! Not like the blobs of chocolate I always get. They look perfect. Uh, I would like one now please, No two:) Photo s certainly mouthwatering. Yay! I am so happy you decided to make the switch! These are my absolute favorite chocolate chip cookie now. I make them far too often, and eat far too many 🙂 Glad you enjoyed them. Just made a half batch and they turned out pretty good. I used King Arthur AP flour so they didn’t spread that much which was fine with me. I also put them in the fridge for about an hour. They were gobbled up pretty quickly! Hi. i have decided to try the recipe. but i kinda have a few questions. 1. i use a convectional oven and the max is 250° Can it still be done? 2. when i put them in the oven, (11-14 mins) what’s the temperature for it? I’m sure these cookies can be made in a convection oven but I’ve never used one before so I don’t have any advice on the temperature conversion – I’m sorry! When you put them in the oven, the temperature should be 325 degrees F (for a conventional oven). I hope that helps! Okay thanks. But what about the preheat timing? I don’t know how long it will take your oven to preheat to the appropriate temperature as all ovens are different. If you don’t have one already, a great kitchen investment is an oven thermometer. They cost between $5-$10, are smaller than the size of your palm, and you can usually find them in the grocery store. This will remove a lot of guesswork that comes with oven temperatures especially when you’re a new baker. Hope that helps!! can an oven thermometer be washed with water? Do you have an easy recipe for an at-home chocolate fountain? I made these and they came out lovely. I have a preference for fewer chocolate chips, and was overwhelmed by them, but I gave them to some friends of mine who begged for more. CERTAINLY a keeper recipe! I just made them and I loved them! They are chewy, not too sweet, not too buttery. I made them with dark chocolate and it tasted amazing. Thank you! I was looking for a good recipe for these type of cookies. I just put a batch in the oven. I had to use self rising flour because my regular flour was too old & yucky. LOL. Other than that I followed your recipe exactly. Or at least I think I did. Only problem was my dough was too soft & squishy to roll into balls. Any thoughts? Do you refirgerate at all first? Or could I? Kristi: Yes, if the dough is too soft, stick it in the fridge for a few minutes when portion it out. Yum, these look so good! 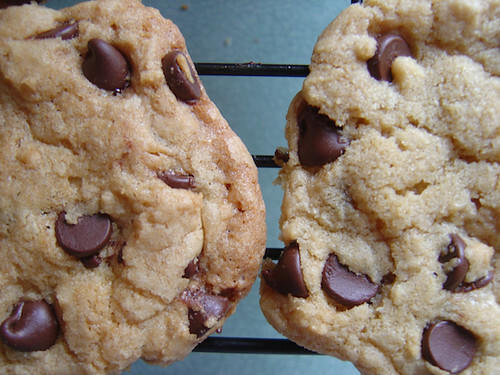 Chocolate chip cookies come out flat too often for me, so thick and chewy sounds perfect. Not to be offensive, but this recipe wasn’t “adapted” from anything. It is, word for word, taken from the Cook’s Illustrated January 1996 edition. It is a great recipe, but you should give the proper credit. I used it for many years until they came out with a better one. I guess you missed my disclaimer above the recipe. You should also know that America’s Test Kitchen and Cook’s Illustrated publishes this recipe in many of their cookbooks so the January 1996 CI edition isn’t the only place it is published. Thanks for taking the time to comment. Oh, dear. I’m going to have to make a great deal more of these. 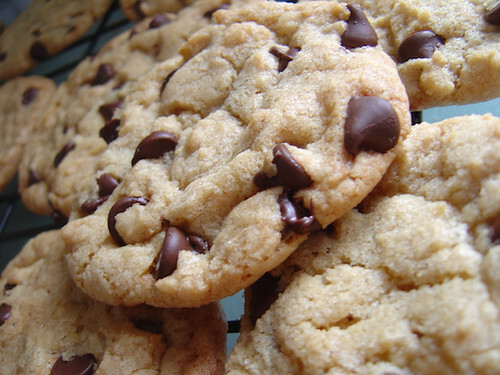 I have been baking for many years now I can passably make a lot of things but chocolate chip cookies have never been one of them. I have NEVER produced a perfect batch of cookies. Not once. Until yesterday when I made these. They are geogeous! And so are you for sharing them, thank you, thank you, thank you. From the bottom of my biscuit deprived heart. 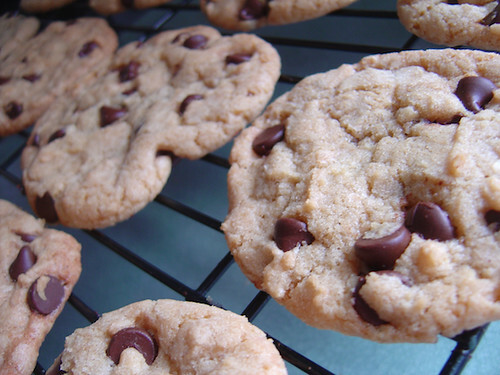 Is it a must to use parchment paper to bake them? or can I just spray/grease cookie sheet? I tried these last night, after my faithful chocolate chip cookie recipe failed on me more than once. They were perfect! Chewy, a bit crunchy, looked like the picture… My hubby raved about them. Thanks for a great new recipe! Can I make these cookis with almond extract? Sure! I would use a little less though since it could definitely overpower the cookies. Hi Elizabeth! I read each and every comment that comes through so please don’t be afraid to comment on older posts. I’m sorry these cookies didn’t work out for you. If they didn’t come together and you followed the recipe exactly, it’s likely because of too much flour in the dough. If the flour gets packed into the measuring cups (sometimes this happens when we aren’t even trying! ), your dough will turn out dry. Next time, try fluffing the flour up before scooping the cup into it or sprinkling it into the cup with another cup and leveling it off with a knife. Alternatively you can weigh your flour – for this recipe, you’ll need 10 2/3 ounces. Hope that helps!